Capture of Achain was credited to one man: S/Sgt. James J. Spurrier, Bluefield, W. Va., a former farmer and Co. G, 134th, squad leader. When 2nd Bn. Attacked Achain Nov. 14, the 22-year-old sergeant entered the town alone from the west while his company drove in from the east. Spurrier shot the first three Nazis with his M-1. 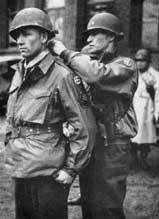 Then, picking up BARs, Yank and German bazookas and grenades wherever he found them, he systematically began to clean out the town. He crumbled one stronghold with bazooka shells, killed three more Nazis with a BAR, captured a garrison commander, a lieutenant and 14 men. Another defense point was silenced when he killed its two occupants. Out of ammunition and under fire from four Nazis, Spurrier hurled a Nazi grenade into the house, killing the four Germans. That night, the one-man army had charge of an outpost. While checking security, he heard four Germans talking in a barn. He set fire to the supply of oil and hay, captured the four as they ran out. Later, he spotted a Kraut crawling toward a sentry, killed him when there was no reply to his challenge. According to the 25-year-old Lt. Col. Frederick Roecker, his battalion CO, Spurrier killed 25 Germans, captured 20 others. In March, 1945, Sgt. Spurrier was awarded the division's first Congressional Medal of Honor.